Motorized golf carts are fine on extremely hilly courses, on courses with marathon walks between holes, on hot or rainy days when there are long waits between shots, and for golfers who have mobility limitations. This said, I generally hate motorized golf carts. I especially hate it when the foursome in front of me drives up to one ball, everyone waits until that player figures out the yardage, decides on a club, takes practice swings, hits, then they drive to the next ball, etc., rather than parking between balls and everyone walking to their shots, hitting, and then moving on. Bad golf cart driving is one of the major causes of slow play, especially if one or more players are spraying the ball. It may seem counter-intuitive, but a walking foursome is faster than all but the most efficient golf cart-driving foursome. Everyone walks to their balls, calculating yardage as they go, hits, meets up by the green. And you know what makes walking more fun, especially if you’re past your 20s and maybe have a tweaky back or knee? A push cart. I don’t care what the talking heads on certain Golf Channel programs say about push carts. I believe push carts will save golf. A prime example of today’s “luxury” carts is the Sun Mountain Pathfinder 3 ($200). With the flip of two levers, the cart unfolds and refolds back into a compact rectangle that fits into the trunk of my mid-sized sedan along with my clubs and about two-dozen pairs of golf shoes. The best part of the Pathfinder is the accessory console, which provides dedicated storage for balls, tees or change, and a small hex wrench in case the wheels need adjustment (which I’ve never found that they do). There’s plenty of room for more in there, too, and even an additional netted storage area in the handle with tons more space. External to the console storage compartment, there’s a slot for your cell phone with an elastic bungee to keep it secure. Your pencil and score card are also held in place by bungees. The only aspect of the design that isn’t spot-on is the score card space, which is too narrow for some common scorecard sizes. The handle is ergonomically designed with spots for the umbrella holder and drink holder, of course. 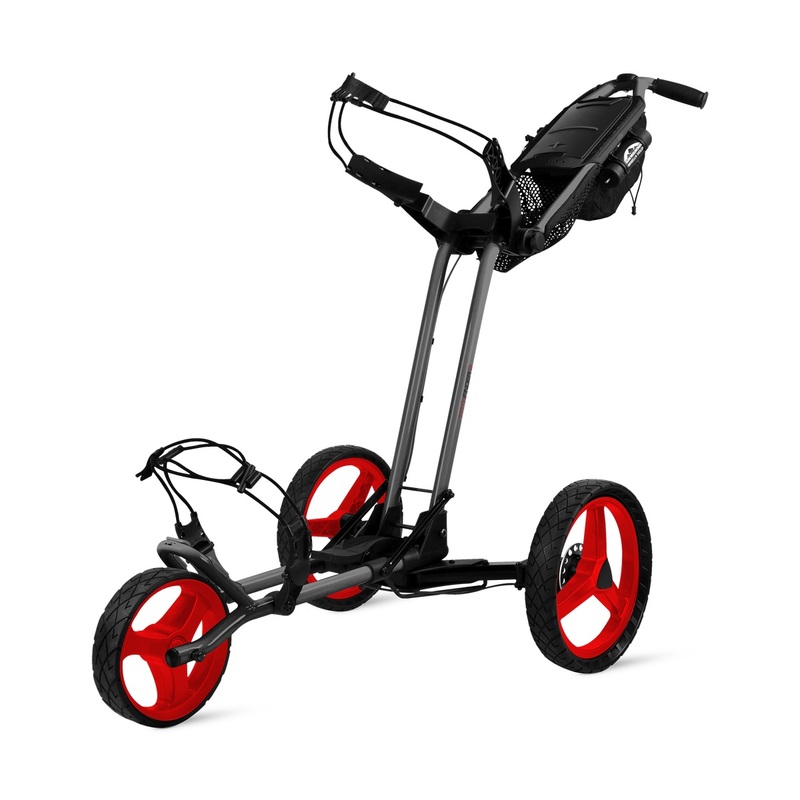 All in all, the Pathfinder 3 turns walking 18 into the pleasurable, comfortable, well-paced experience that golf should be. If you’re able to walk, and your course is built to be walkable, I highly recommend getting a push cart for at least some rounds. Your body and your game will thank you for it.